Applications of AI surround us in our daily lives – ever use an app to get around traffic? How about checking your social media feeds? Or shopping online? Or maybe reviewing your email inbox, noting that spam had been filtered away? As our society integrates AI into our daily lives, it’s important to note that the upcoming generation has always lived with AI. It’s a normal and comfortable part of their lives – and how well can they be equipped to actually understand it? Cue Generation AI Nexus, a collaborative program created by MITRE and leading academic institutions and technology companies to develop 1,000,000 students into technical leaders across the United States, skilled and knowledgeable in the fields of artificial intelligence, machine learning, and data science. 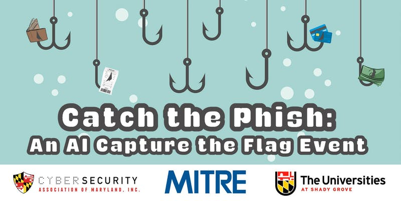 The topic of the challenge is phishing – a tactic of tricking people into visiting websites and opening emails that appear benign but are actually malicious. “We’re posing a real-world problem to get students thinking about cybersecurity, data science, and machine learning,” explains Eric Harley, cyber security analytics researcher and challenge designer for the hackathon. “How can we use new cutting-edge techniques from AI and machine learning in these really hard problems in cybersecurity? Students will use datasets in Jupyter Notebooks, an open-source web application, and complete tasks in analyzing and building a statistical model around URLs, detect and model beaconing (a technique to track who is reading a webpage), and using machine learning to discover patterns in algorithmically-generated domains. There are five main barriers to AI, data science, and machine learning exposure: cultivating interest, obtaining data, having broad curricula, setting up computing environments, and paying for computing time. One of the first barriers to getting students involved in AI and data science is reaching students who may not be interested in computer science. Hackathons and technical challenges may draw current STEM students, but what about social sciences, humanities, arts? This barrier ties into two others – access to clean and curated datasets and broad curricula across disciplines. While there are many open source datasets online, they are often incomplete or outdated and not of a high enough quality for classroom use. Furthermore, it would be ideal to have datasets and lesson plans in multiple fields, especially ones that traditionally may not use AI or data science techniques yet also deal with vast amounts of unstructured data. Imagine how research and learning would revolutionize if a history or literature department has access to high quality, searchable, and annotated texts, along with students who know the power of machine learning and data science. But once the datasets and curricula are ready, these students and researchers need AI computing environments that are user-friendly, easily accessible, and affordable. Generation AI Nexus suggests setting up these environments in the cloud, eliminating the need for setting up systems on individual workstations. Furthermore, Generation AI Nexus has partnered with cloud companies for cloud credits, a currency for accessing cloud services, so that students and universities can learn and experiment more freely.